Electric cars offer a different driving dynamic than their traditional, gasoline-powered counterparts. Their batteries make them heavier and they produce instant torque. At this year’s 2018 Geneva Motor Show, Goodyear revealed a prototype that’s specially designed with electric cars in mind. 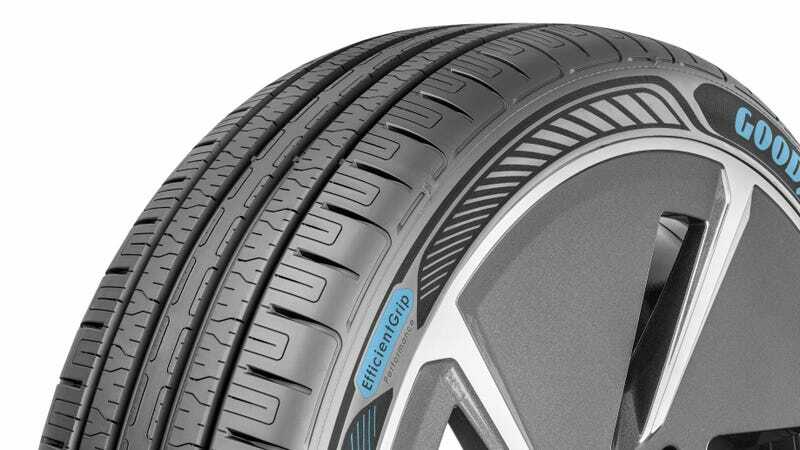 The tire is called the EfficientGrip Performance with Goodyear’s Electric Drive technology. It’s a mouthful, but it’s supposed to be technical anyway. Goodyear’s testing found that traditional tires wear out 30 percent faster with used on electric vehicles due to the instant torque and the extra weight from the battery packs, the company reported in a press release. Goodyear claims that the new tire can combat these challenges. The new tread design uses thinner channels, so a bigger contact patch touches the road surface, which means better grip for all that torque. Additionally, the design also lowers tire noise. The tire cavity shape is meant to support the extra vehicle weight without distorting and losing grip. And finally, the entire tire is designed with extending the car’s range in mind. It’s made from a compound that has low rolling resistance, the sidewall is aerodynamic and the profile has less rotating mass. Goodyear says that the tire will be on the road in Europe by 2019, though it’s unclear if it will bring the tire here. I imagine it would, though. We have reached out to Goodyear for clarification and will update if we hear back.